Straight line depreciation is the simplest way to calculate an asset’s loss of value (or depreciation) over time. It is used for bookkeeping purposes to spread the cost of an asset evenly over multiple years. It can also be used to calculate income tax deductions, but only for some assets, like nonresidential property, patents and software. Although it’s possible to calculate depreciation on your own, it could also be helpful to use a bookkeeping service like Bench. They’ll help you streamline your bookkeeping, and maximize your deductions. With bookkeeping packages starting at $95 per month, reach out to Bench to get your free consultation. How Does Straight Line Depreciation Work? This makes straight line depreciation distinct from other methods (like Double Declining Balance or Sum of the Years Digits), which report a higher cost early on, and less in subsequent years. These methods are usually preferred for items like cars and electronics, which tend to lose their value at a faster rate. The main advantage to straight line depreciation is it’s simplicity, and the fact that it can be used to deduct SOME items with the IRS. We’ll explain exactly when to use straight depreciation next. When is Straight Line Depreciation Used? When you purchase a fixed asset for your business, like a vehicle, computer or furniture, you generally cannot write the entire cost off in the first year. Instead, you have to spread the deduction out across the timespan you’ll be using it. One glaring exception to this is Section 179, which lets you deduct the full cost of some assets in a single year (up to $500,000 total). However, if you do not qualify for Section 179, or if your purchases exceed $500,000, you’ll need to use an alternate method. Straight line is one of the methods allowed by the IRS to deduct assets over multiple years. The vast majority of the time, however, you’ll use a different method known as MACRS. The straight line method is typically only used for intangible assets like software and copyrights, as well as nonresidential real property. Depreciation may also be reported on your books. If you use the cash basis accounting method, then you do not have to depreciate fixed assets for accounting purposes (you still have to depreciate assets for tax purposes on your tax return). However, if you purchase expensive assets for your business and do not record depreciation on your books, your financial statements may not accurately reflect how well your business is really doing. This is the reason why many companies keep two sets of books. Your tax-adjusted basis books are based on what you use to calculate your tax deduction, whereas your book-adjusted basis books are based on what an asset is worth for internal or external use (e.g. showing your profits to investors or lenders). Depending on what assets you’re depreciating, you might use straight line depreciation for both your tax deduction and books. Or you might use different depreciation methods for your taxes and books. To learn more about all of the depreciation methods, check out our article What is Depreciation and How Does it Work? How Do I Calculate Straight Line Depreciation? Cost basis of the asset – The total cost of the item including taxes, shipping, etc. If you prefer to have a bookkeepers help, check out Bench. Their experienced small business accountants calculate depreciation for you, manage your monthly books, and help you maximize your deductions at tax time. Packages start at $95 per month. The cost basis of the asset will generally include all of the expenses that you incurred to get the asset up and running for use in your business. This includes but is not limited to any shipping or delivery costs, installation charges, sales tax and other indirect costs. For example, if you purchased a machine and had to get someone to come out and run tests before you could use it, that should also be included in the calculation of the cost basis of the machine. The salvage value is the estimated amount the asset will be worth if you were to sell it at the end of its useful life. For example, if you had a car that you wanted to trade in for a new one, the value of the old car would be based on the Kelley Blue Book value, which is what the dealer will pay you (salvage value) for that car. The estimated useful life is the amount of time you expect an asset to last. Sometimes an asset may last longer than you expect it to and other times it may not. It really depends on the wear and tear on the asset as you use it over the years. The IRS has provided a guide on the recovery period (useful life) based on the type of business asset purchased. Below is a summarized table of the depreciation recovery periods as defined by the IRS. I have listed 3, 5 and 7 year property in the table below. However, you can find the full list of properties in IRS Pub 946. Example: Let’s say you purchased a brand new computer, a monitor, and a desk for your office. Below is a summary of the cost basis (including sales tax, shipping, installation & any other costs), the salvage amount and the useful life taken from the IRS table. What are the Advantages and Disadvantages of Using Straight Line Depreciation? It can be used for tax purposes to calculate a tax deduction for intangible assets like patents and copyrights. It can also be used to report depreciation for accounting purposes. Straight line depreciation assumes that an asset will decline in value equally over its useful life. However, most assets lose a greater portion of their useful life in the early years. For example, cars and computers lose their value in the first few years. Be sure to check out double declining balance or sum of the years digits. Both of these depreciation methods will allow you to write off a higher amount of depreciation in the earlier years and lower depreciation in the later years. Straight line depreciation can be used as a tax deduction for intangible assets like patents and copyrights. To determine the deductible amount of depreciation expense for tax purposes, you will need to complete Form 4562. As we discussed, the amount you can deduct on your taxes might differ from what you are eligible to expense on your books. You should record depreciation expense on a monthly basis so that your profit and loss statement and balance sheet report remain up-to-date. Depreciation expense will increase the total expenses on your profit and loss statement. Your balance sheet will include the accumulated depreciation account. The accumulated depreciation account will reduce the overall value of your fixed assets. You will record depreciation expense using a journal entry. Like most business expenses, you must keep all receipts, titles and contracts that show the date of purchase, you as the listed owner, and the amount that you paid for every asset. This includes receipts for any amounts included to calculate the cost basis (i.e. installation, sales tax, shipping, etc.) of the asset. Can QuickBooks Help Me Keep Track of Depreciation? QuickBooks is our recommended accounting software for small businesses. Unfortunately it will not calculate depreciation expense for you. However, you can purchase fixed asset software that is designed to help you track and calculate depreciation for all of your fixed assets. 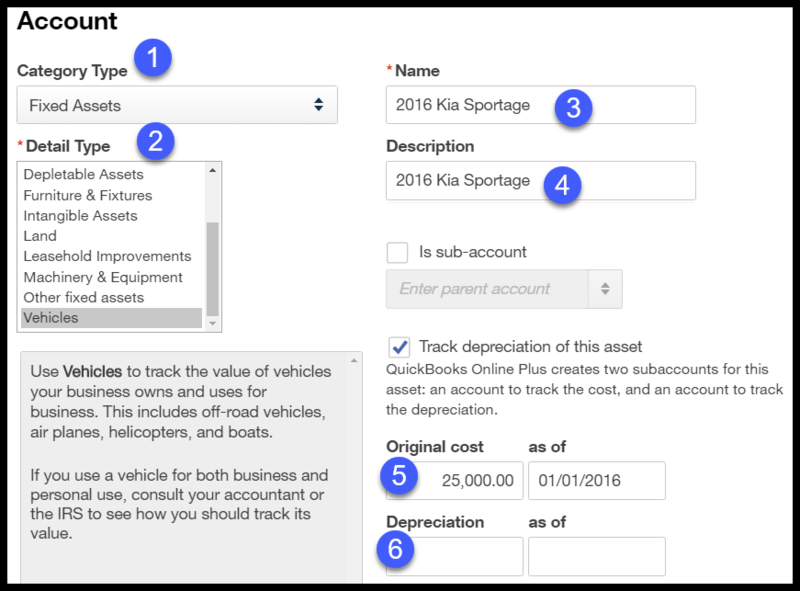 What you can do with QuickBooks is keep track of all of your fixed asset purchases by setting them up on the chart of accounts list. You can run a chart of accounts report, export it to Excel and it will include most of the info that you need to create the depreciation schedule we discussed earlier in this article. Detail Type: Select the type of fixed asset (i.e. Vehicles). Description: You can enter the same info as the name field or provide any additional info about the fixed asset in this field. Original cost/as of date: The original cost of the asset and the date of purchase should be entered here. Depreciation/as of date: Any accumulated depreciation that you may have already taken. Tip: You will only complete this field if you started depreciating the asset prior to setting it up in QuickBooks. You can export this report to Excel, add the additional info that we discussed earlier should be included on your depreciation schedules and save it. If you’re in the market for a new accounting software, we recommend QuickBooks for small businesses. We have created a free QuickBooks Online course that will help you set up and manage your books in no time. There are step by step instructions and videos to show you how to do it! You can click here to visit our course now. By now I hope you have a better understanding of how to calculate straight line depreciation, the impact it has on your financial statements and some of the advantages and disadvantages to using this method. If tax time is getting more and more complicated for you, it might make sense to get in touch with an experienced small business bookkeeper like the team at Bench. They make sure your books are all legal, up-to-date, and maximize your deductions at tax time. Packages start at just $95 a month.